How did you break your bread fast? The Tunisian Sandwich. For the last night of Passover to break the bread fast, many Tunisians will go to a Tunisian store to take out a special sandwich called Casse-Croûte. This sandwich is made on an Italian style bread loaf or large roll (very crunchy on the outside and soft on the inside) spread with harissa or Tunisian hot sauce, pickled red bell peppers or cooked red pepper and tomato salad (mechouia/makbouba), and olive oil, then filled with sliced olives, canned tuna, capers, and sliced hardboiled eggs, salt, and pepper. Yes, it is greasy, but VERY delicious, and many will describe that sensational moment of their first bite after a long week of abstinence from bread. How did you break your bread fast? What did you eat? 2. Open up roll and brush both sides generously with olive oil. 3. Sprinkle both sides with the chopped red peppers, onions, and coriander leaves. 4. Layer both sides with the tomato slices, followed by the egg, and the tuna running down the middle. 5. Garnish with the capers and olives, and drizzle with extra olive oil, lemon juice, salt and black pepper, and lastly harissa or special Tunisian hot sauce, if desired. Cut sandwich in half or in thirds and serve immediately. 1. Preheat the broiler (set on “Hi” if using an electric oven). 2. Rub a small amount of olive oil all around the outside of each pepper and garlic clove, then place them onto a baking sheet or pan and set under the broiler. Once garlic cloves begin to turn a brownish-black color (after 8 to 10 minutes), remove from pan and place onto a plate to cool. When skins of peppers begin to blacken and blister (an additional 5 minutes), turn each one over to broil the opposite side (another 10 to 15 minutes). Keep turning and rotating the peppers until all sides blister. Remove from the broiler and let cool until lukewarm. Meanwhile, prepare the spices. 3. Place the caraway seeds and coriander seeds into a small frying pan or skillet and toast, over medium heat, until they start to pop and crackle, about 2 to 3 minutes. (Shake pan every minute or so to prevent burning). Remove from heat and cool completely (about 10 minutes). Place into a spice grinder or mortar and pestle and grind until fine. Set aside and return to the peppers. 4. (Note: For handling the hot peppers you may want to wear rubber gloves to prevent your hands and fingers from burning; Be careful of wiping your eyes and make sure to wash your hands thoroughly when done!) Pull out the stems from each pepper and discard. Gently peel away the thin skin from the bell pepper and discard (no need to do this for the hot peppers). Cut each pepper in half, and using a spoon or a paper towel, gently scrape out and discard all of the seeds from the inside of each pepper. 5. Very coarsely cut the peppers (1-inch pieces is fine) and place into a food processor, along with the whole garlic cloves. 6. Add the 2 tablespoons of olive oil and pulse until the peppers are very finely pureed. 7. Add the ground caraway-coriander mixture, sugar, and salt, and pulse until very smooth. Add the fresh coriander or parsley leaves and pulse one more time to blend. 8. Serve sprinkled with olive oil, and finely chopped coriander leaves and/or parsley leaves, alongside grilled meat, chicken or fish, or as a garnish with soups and stews, or sprinkled over your favorite salad or sandwich. Store in an air-tight container in the refrigerator (sprinkled with olive oil to prevent spoilage), for up to 1 week. 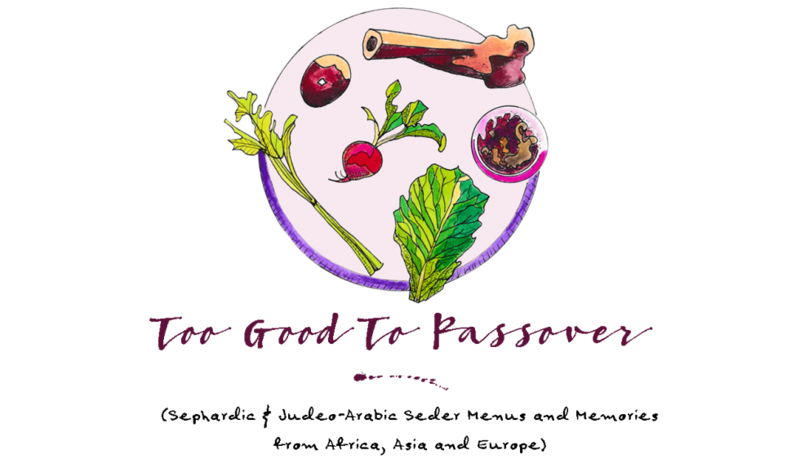 ← Send me a photo of your Seder plate! Where can I get one? Those Tunisians know how to break a bread fast in style!